For those wondering what a LOOGY is, it’s not a gooey expectoration of the throat. Rather, it is a Lefthanded One Out GuY. There seems to be concern in Mets’ camp over who wil retire lefthanded batters. Not sure why, other than the stupid thinking that you need a lefthanded pitcher to get lefthanded batters out. It’s an interesting theory, and if you dig enough, or manipulate enough, you’ll find numbers to support the theory. In reality, good pitching gets out good hitting, regardless of which hand is used to throw the ball. The California Angels have earned the reputation as having one of, if not the, strongest bullpens in the Major Leagues over the last few years. They don’t have a lefty. Instead, they have great pitchers. The Mets say they can do the same, and in the next breath say they need Aaron Heilman to return to the pen partly because of his success against lefthanded hitters. What it comes down to is, Heilman is a great pitcher: he pitches well against lefties and righties. Still, Willie Randolph is doing all he can in spring training to give looks to a plethora of less-than-adequate lefties, hoping that one will remarkably emerge as the perfect LOOGY. There is one HUGE problem with this goal: the Mets already have the Major Leagues’ only ROOGY. 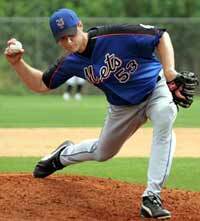 That’s right, the Mets have a Righthanded One Out GuY, his name is Chad Bradford. A Major League team cannot afford to have both a LOOGY and a ROOGY; it’s inefficient, stupid, and takes a bat and glove off the bench. Outside of Ring, the Mets have Pedro Feliciano, Juan Perez, and Darren Oliver auditioning for the LOOGY spot. Feliciano couldn’t cut it in the ML in the past and went to Japan, where he was only OK. Perez has spent his career in the Red Sox minor league system and not yet thrown a ball at the ML level, a scary thought considering the demand for lefthanded pitchers (Jesse Orosco is still getting calls to come out of retirement). And get this: Oliver, who was released by two teams last year, is a better pitcher against RIGHTHANDED hitters, lifetime, than against lefties! So what should the Mets do? Forget about the LOOGY. Keep Ring around, dump the other three pretenders, and make the final week of spring training a competition among the best PITCHERS, and bring the best arms north. Wasting valuable innings on these lackluster LOOGYs is an exercise of futility.